I used sequencer this year with a 16 ckt controller. Built my own sequences and had no real problems i couldn't solve. Now I am using the pro version with S5 and trying to get a CCB with 2 strings to work. It tests fine with HU but I can't seem to get sequencer to give me a full list of the circuits I need. I can get to a point where it will give me Unit ID 01:01 to 01:16 then it switches to unit 2 up to 16 and so on. the first 16 channels work the lights, after that from 2 on nothing does. How do I get it to list all 100 or 300 all showing unit 1? Sounds like you are talking about opening the channels in SE to show all 300 channels. S5 doesn't do that like S4 and earlier versions did. This is something that many have complained about and LOR has mentioned that they will add that feature in a future release. It's all how you built your preview. It sounds like you left the Max Circuits to 16 (near the upper right corner in the screen capture below). BTW, this is one of my CCP based arches. maybe I need to go back to S4. Seems silly. I don't see a channel config section anywhere in S5 either. Thanks for the input. I double checked and I do have prop set up for 510. Thanks though. I am a newbie at this and it could be something simple I'm missing. In S5, all channel settings are in the Preview. 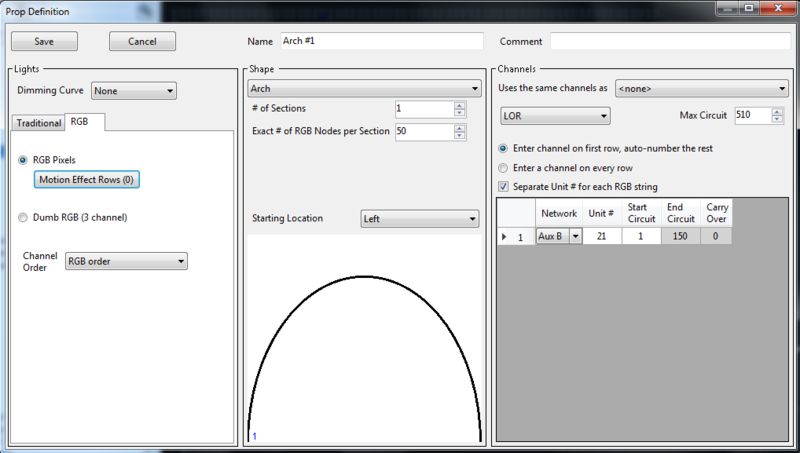 On the section below the Max Channel when my screen capture shows Network AuxB, Unit # 21, Start circuit 1, and End circuit 150; does yours show 150 channels for each CCB string or many rows of 16 channels each?